Seller will give you a gift certificate in the amount of 22,45 RUB for a positive review of the product purchased. 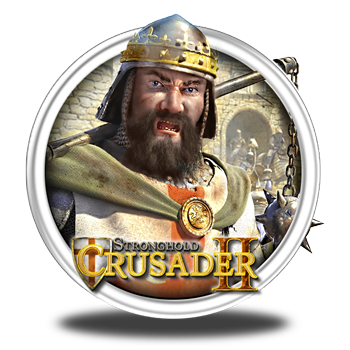 Stronghold Crusader 2 - a long-awaited sequel to the original castle-sim Stronghold: Crusader. After 12 years Stronghold comes back in 1189 in the Middle Eastern desert, but with a new 3D-engine and realistic system of locks destruction created using Havok Physics. Firefly Studios recreate the authentic simulation of locks with a quick and exciting gameplay. New Stronghold true to its roots and is an old-school game that combines the elements of real-time strategy and simulation of urban development. Making a choice between fierce crusaders and Arab freedom fighters, you have to lead into battle large armies and siege equipment to decide the fate of the Holy Land. Join the war in the name of Richard the Lionheart or the Sultan of Syria in two historic single player campaign where you will be accompanied by dynamic events, such as tornadoes and locust invasion. Become the greatest Lord, taking the reins of management of the economy in the wilderness, and holding on kontol vital oases. 1. To access your new game, you need to install Steam application (if the application is not installed). 3. After the purchase, you will receive a link that needs to be copied and pasted into your Internet browser to log in under her own account Steam and take a gift to the library or add to your inventory. Seller will give you a gift certificate in the amount of 22,45 RUB for a positive review of the product purchased..